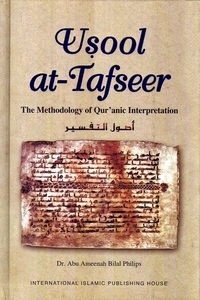 This book is a detailed explanation of the basic principles of Qur'anic Interpretation, Usool at Tafseer. It is a necessary handbook for anyone who wishes to acquire an understanding of Allah's book, The Noble Qur'an. Introducing the reader to the science of tafseer and its renowned scholars, the author explores the methods of revelation and collection of the Qur'anic text, presenting an extraordinary behind-the-scenes look upon the history and meaning of the Glorious Qur'an. What do people say about Usool at-Tafseer? "A rare insight and a must read for those seeking an in-depth understanding of the phenomenon of the Qur'an. The author has aptly communicated a complex subject in a very simple and clear style."